Winthorpe County Primary School P.T.A. 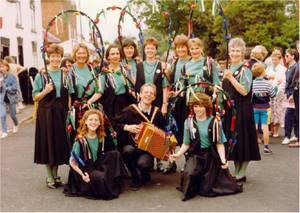 The Oaks and Acorns Dance Group was formed in the autumn of 1988 by Paul Cooper and Diane McClymont. Combining their two backgrounds and interests in traditional dancing, they had been organising the Morris dance team at the school in Winthorpe for the previous eight years, and had regularly been asked over that time when they would organise an adult team in the village. 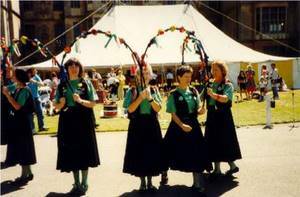 As a result, in September 1988, the Winthorpe Garland Dancers was formed. Every Friday evening a group of energetic ladies and two ex-pupils of Winthorpe Morris team met at the Winthorpe Youth Centre to learn Morris and Garland dances. Over the next couple of years other ex-graduates of the Winthorpe School team, already highly experienced dancers, augmented the team. From early on, the mix of dances comprised garland dances with some Cotswold Morris dances and some unique dances put together by Paul Cooper. In order to dance out at events in 1989 a kit was hastily bought and put together consisting of some (dreaded and disliked) puce coloured skirts and scarves and white T-shirts. 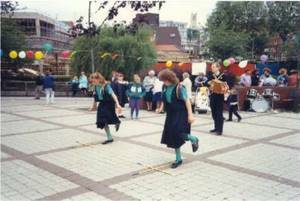 The Newark Advertiser publicised the group "The Winthorpe Garland Dancers" on June 23rd 1989. In 1990/91, a new name was sought for the group to reflect the fact that some of the dancers came from outside the village. Given their Nottinghamshire link, with its oak tree logo, there was a strong feeling for the name Oaks and Acorns. It also seemed fitting, as they were a mixture of older "Oak" members and younger "Acorn" members from the previous school team. 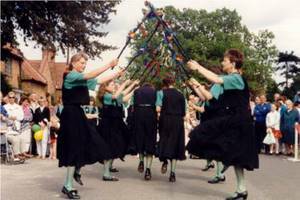 A kit modification followed the name change and for several seasons dancers wore green T-shirts and tights to give an "oaks and acorns" complement to the black skirts and waistcoats. Around 1993 the look was again updated. A Liberty autumn forest print was chosen for the waistcoats and more autumnal shades were introduced for skirts and blouses. Also, at this time the group decided to have their practice evenings at Coddington Village Hall, which was more central for the group as a whole. 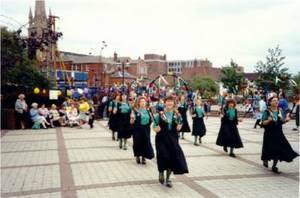 Over the years the group was highly successful performing at many local venues such as Southwell, Lincoln and Newark and at local events including the May Fair at Collingham, Farnsfield Summer Event, Kinoulton Show, Harlaxton Show, and Retford Day of Dance. Sadly in 1994/95 the group was disbanded due to members leaving the area, young members going off to college etc. and being unable to attract new members to allow the group to continue. It was great fun while it lasted. Report featured in The Folk News Magazine. September 1990. Oaks and Acorns started two years ago and meet on Friday nights in the Youth Centre in Winthorpe village. Now fourteen strong and in their third season, they are still keen to expand their numbers for 1991. They're looking for women dancers, and men can join too-but only as musicians. "Our pilot group of women (most of whom are still dancing although we are now more numerous) wanted to garland dance, so garland we did; until we found that in amongst the garland dances we added a hankie dance or two and then a stick dance or three. Presumably other teams also find this is how their repertoire expands. Last year the team gave over a dozen performances around Nottinghamshire and Lincolnshire and was featured in the Newark Advertiser and on Radio Lincolnshire. (How do you feature dancing on the radio?-write in with answers please).